It’s my 31st birthday today, yippee hooray!… Although I don’t feel as fresh as I perhaps hoped I would, managed to drink a tad too much Prosecco last night at Mahiki. Have woken up to some very unflattering pictures of myself on Facebook. In one of them I’m sprawled over my poor friend Rachel, drinking out of a giant cocktail treasure chest through a very long straw. Classy. Anyway, it was fun so who cares. 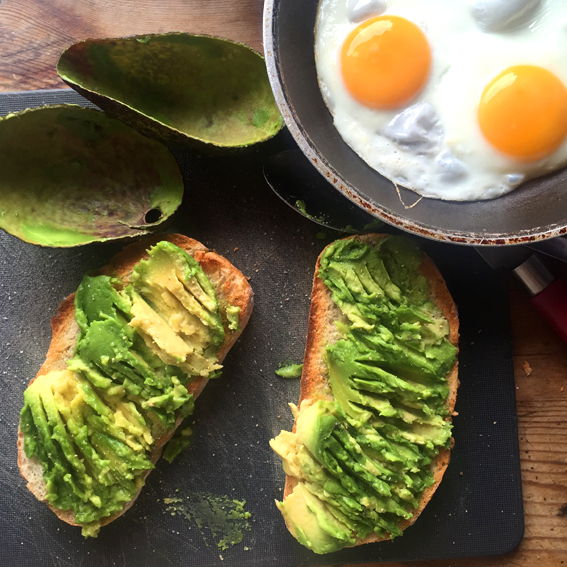 This is my favourite hangover breakfast (so end up eating it most weekends). It’s super quick, super easy and super tasty. I tend to always have some sliced sourdough in the freezer for hangover emergencies such as this one, I suggest you start doing the same. It also helps that I live with an avocado addict so I always have the bits I need to make this. This is very basic so not going to go into too much detail… Start by toasting your sourdough and start frying your eggs. Shell your garlic clove and rub it over the toasted sourdough. Scoop out the avocado and squash it on top of each slice with a fork and season. Top with the fried eggs and and sprinkle with salt and pepper. Add a couple of puddles of sweet chilli sauce and bish bash bosh, you’re DONE! Happy Birthday! I celebrated last night for you, sadly no avocados in the house this morning.